If RaceCapture isn't operating as expected, there are a few places to inspect that can help understand what's going on. The System status page provides information on the status of various parts of the RaceCapture system. See the comprehensive CAN bus troubleshooting guide to diagnose issues receiving CAN bus data. Use a high quality, high speed 32GB or smaller SD card. The RaceCapture hardware will generate messages that can provide insight into specific problems. Check the box next to Poll Log at the bottom of the screen. The RaceCapture app will periodically query RaceCapture for log information. 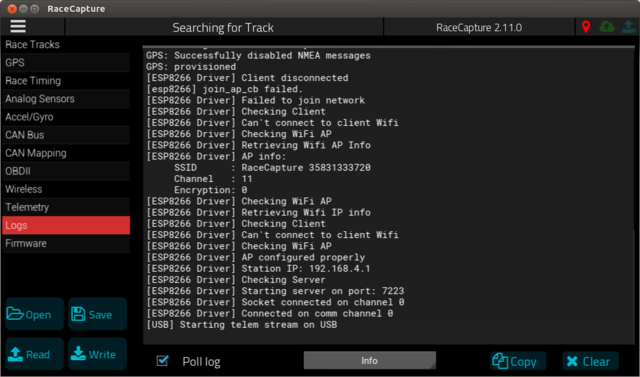 The log window will show messages from RaceCapture - scan these message for any errors. You can also copy the text in the log for future reference by pressing the Copy button. 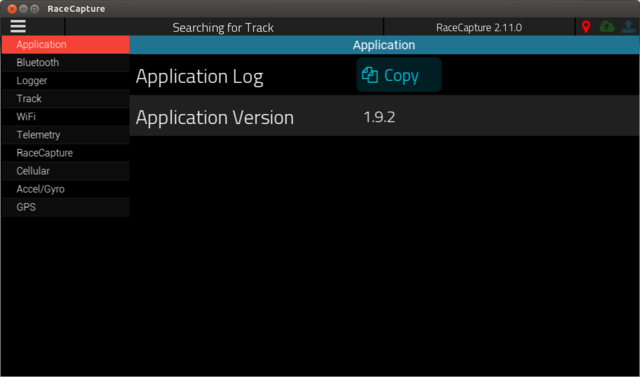 The RaceCapture app itself generates it's own log messages, separate from the RaceCapture hardware. Press the Copy button. This will copy the current application log to the system's clipboard. Paste the log into an email or document to review it's contents. Periodically you will need to save your configuration as a backup or for sharing. Press the Save button to save the current configuration to the file you specify. The saved RaceCapture configuration file will have the extension '.rcp'. Launch a serial terminal program such as RealTerm or HyperTerminal (Windows), Minicom (Linux or OSX), and connect to the serial port assigned to RaceCapture. Press Return on keyboard to see a list of commands. Your RaceCapture system will be restored to a factory default configuration. Flash a previous firmware that changes the major or minor version (major.minor.bugfix). This triggers an automatic factory reset. Example: If you are on 2.13.5, flash 2.12.0. Then, you can re-flash the original firmware. 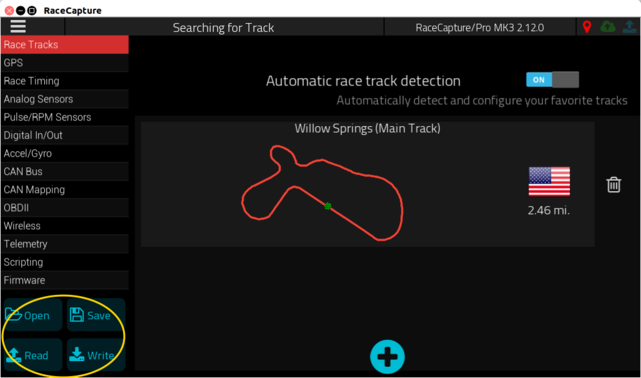 Note: If the RaceCapture App cannot connect to your device, then you may need to load a previously saved configuration to access the firmware update menu. The datastore file is called datastore.sq3 and is stored in the user's storage for the RaceCapture app. This file is stored in a different location based on the operating system you are using. 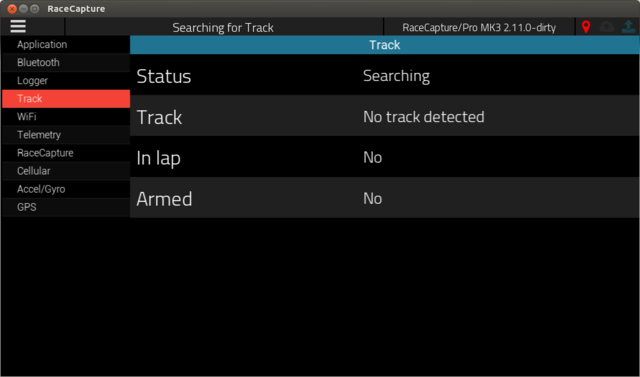 To find it's location, launch the RaceCapture app and immediately go to the System Status view and press the Copy button to copy the application log file to the system's clipboard. Open notepad or similar text editor and paste the RaceCapture app's log. You will find the location of the datastore in the log messages, starting with the phrase Datastore Path: . Make a note of this path. Browse to the location you previously noted. You should find a file called datastore.sq3. Move this file out of the current directory, to a separate location for safe keeping, if necessary. If you do not have a need for the old datastore, you can safely remove it. Now, re-launch the RaceCapture app. The RaceCapture app will create a fresh, empty datastore.sq3. You can now import your logs as needed. If your RaceCapture/Pro MK3 seems to be stuck in bootloader mode (rapidly orange flashing light and app cannot connect), you may have a stuck button on the front panel. Normally the bootloader is activated while holding down the front button while powering up, but if the button is stuck, the unit will go into bootloader mode unexpectedly. Check if the button has been pushed down excessively on an edge; use a fingernail or tool to pull the edge up. Note: When you press the button, you should feel a click when the switch engages.